Malaga Airport Transfers reviews completed by Michael Cairns who stayed at Cerros de Aguila in Mijas Costa and Tina Stevenson who was in the Hotel NH Marbella. I have posted the clients surveys at the bottom of this page that have agreed for us to use their information. Ceros de Aguila is inland 5km from the nearest main town Fuengirola. It takes about 7 minute drive to the centre of Fuengirola and 14 minutes to Mijas Pueblo. Michael Cairnes commented on his survey with the following eight marks. He voted a full house of 5s. Michaels favourite restaurant and bar was Colan. He did say a rent a car was needed and accommodation was suitable for disabled persons. Ryanair brought Michaels party of 7 to Malaga Airport from Newcastle in England for 12 nights. Favourite airline was voted as Jet2 and Ryan air. In the any other comments section Michael wrote “taxi transfer quick and pleasant” which is always good to hear. Michael would book again. 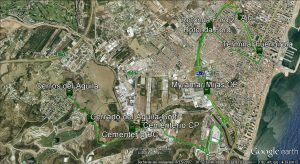 John and Michael would like to thank Michael and company for choosing malagaairporttransfers.com for using them to transfer from Malaga Airport to Cerros De Aguila. This transfer from Malaga Airport to Cerros De Aguila and back to Malaga Airport at the end of their stay cost 95 euro. You can pay on arrival and free child seats are available. Tina Stevenson was transferred to Hotel NH Marbella from Malaga Airport on 23-10-18. 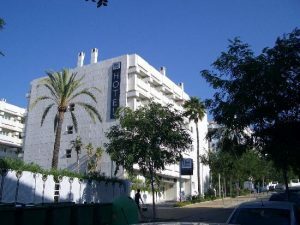 The NH Marbella is a 4 star hotel which is very close to Marbella centre. The famous Orange Square is approximately 19 minutes walk from the hotel. You are 60 minutes walk from Puerto Banus which you can reach by walking along the Marbella promenade which is a very pleasant walk. Tina marked her eight questions on the survey as three with a 5 and five with a 4. Tina´s party of twelve voted De Bruno as the favourite bar and Astral as the best bar. The beach is 10 minutes walk but no need to rent a car. Tina and friends flew from Manchester airport to Malaga Airport with Ryanair but voted Jet2 as their favourite airline. The pool and accommodation was suitable for disabled persons and they voted to come back again. At the end of their 3 night stay on the 26-10-19 they travelled back to Malaga Airport with malagaairporttransfers.com . The cost of this return transfer was 209 euro. You can pay on arrival and free child seats are available. John and Michael would like to thank Tina and friends for their kind comments and look forward to transferring them in the future.